Let’s face it no one is going to be able to drag your bones from the welcoming embrace of the bedsheets if you don’t want to. Sometimes, and it happens to even the most dedicated of runners, the very thought of slipping on the track shoes can be about the least appealing pastime one can think of. The vast majority will quickly recover from this brief period of demotivation, and it could be simply a symptom of having overdone the amount of running in the past week or so. But there is a minority who are in danger of letting their routine slip, to the extent that within 10 days they are back to square one. This is one of the situations when it really does pay to have a running partner. Not only will they be knocking on your door, ready to hit the road or the gym, but the thought of letting them down, sneaking your head round the door and saying: “Sorry, can’t manage it to today”, can be enough to overcome those fleeting thoughts of taking the easy option. Of course, this is a reciprocal arrangement. As such, unless your partner is the sporting equivalent of a saint, they are going to be glad when the same thing happens to them, and it is you cajoling them to get their backside in gear. And even if you don’t feel guilty about letting them down, there is always the competitive element to spur the both of you on. A great many fitness regimes can start out with good intentions after a drink or two in the local bar. Each individual, while sounding as positive about the experience as possible, also has one thought at the back of their mind: “Which one of us will crack first?” Both may initially doubt the running will last long, but equally they will be loath to be the one who gives up. This in itself can be enough to propel both of them through the first few weeks of physical and psychological effort, by which time you’ve both forgotten all about hoping the other “cracks first” and are instead pushing each other to improve. Competition is indeed healthy between running partners, but it has to be kept within limits. Some will develop quicker than others, and while having a partner is useful in terms of encouragement, the sight of your companion speeding off up the hill can have only a demoralising effect. So from day one, draw up a schedule and agree that you should both stick to it. Some do not require any such support to develop their running. Indeed, they may think that the very idea of having a partner is the sporting equivalent of a lead weight around their ankle. They want to go at their own pace, and in their own time, rather than having to go at a time of day that is also convenient for the other partner. If an individual possesses the discipline to be able to run solo, then that is the route that they should choose. However, there is one other aspect of running with a partner that should not be overlooked and that is safety, primarily if your training involves outdoor routes around streets or parks. It is equally relevant whether you are male or female, and whatever time of day you train at, although after sunset does carry additional danger for obvious reasons. 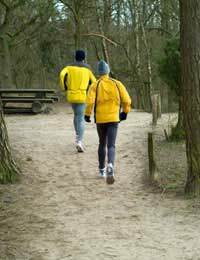 Not only will your partner present a problem to a potential attacker or attackers because they will always prefer to target solo runners but he or she also possesses an extra pair of eyes and ears that can increase awareness of any threat around or ahead of you and make the necessary adjustments to your route. Sometimes, two can be more than just company.